AYA was on my anticipated list for Essen 2015, and I was crushed to hear that it did not make the show due to some transport issues. Since I was at one of the world’s largest boardgame fairs, there were plenty of other games to look at instead – but the game remained on my radar. I was excited to hear from the designer of the game who contacted me with an opportunity to play the game. 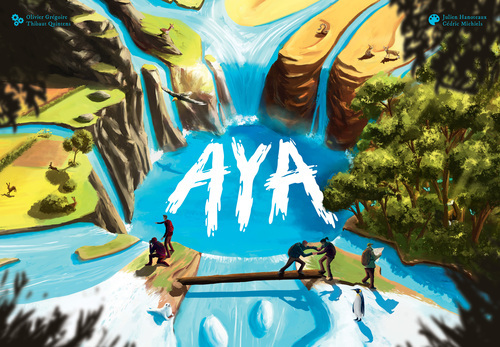 AYA is a very eye-appealing game (as I saw from my first glance at it during the press show on the Wednesday of Essen). 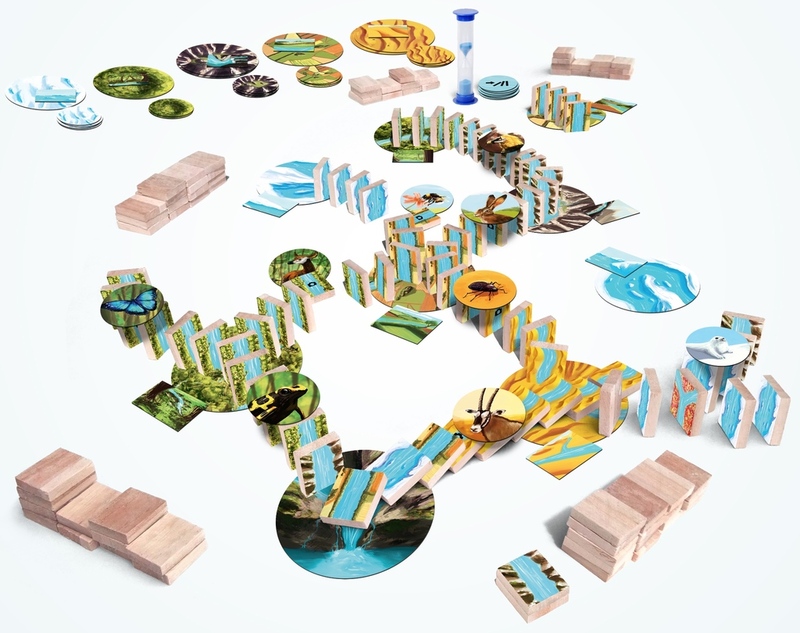 It is a cooperative game where players build a river using domino like pieces and they try to take successful pictures of the landscapes and animals of the various regions of the world. At the start of the game, the dominoes are stacked on the sides of the board – much like the start of a Mahjongg game. Each player gets their own supply of domino tiles (39 in a 4 player game). 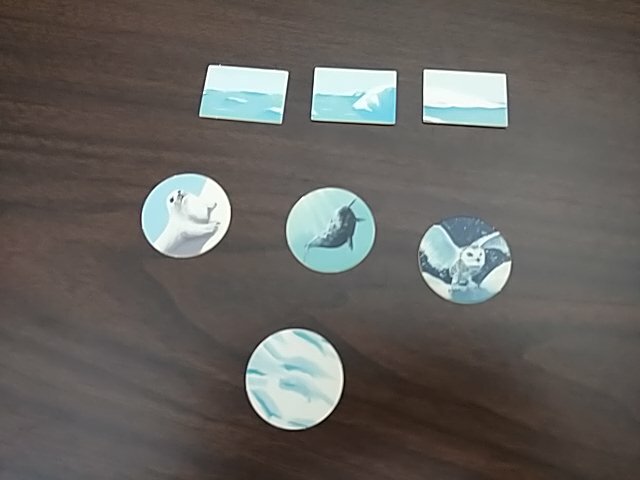 The start tile is placed somewhere on the table and all of the Animal Photo tokens are placed in matching stacks. The Landscape tokens and Landscape Photo tokens are intercalated and placed into their own stacks as well. The game is played in three phases – though the bulk of the time is spent in the first phase: Placing Domino Tiles. Once the tiles are placed, the Toppling Phase happens where the domino trail is knocked over. Finally, in the Scoring phase, the team sees how well they did! There is a hourglass which runs for about 10 minutes. It is used in the Placing phase. The timer is turned over and then each player takes their turn around the board. 2) Playing your domino – the tile can be played upright on the table or on a landscape tile. It can also be placed face up on your reserve stack. The domino does not have to placed directly adjacent to a previously played tile – it can go anywhere on the table. If you accidentally topple dominoes in this phase, you must put them all back in their original positions before going to the next player. If the player plays a domino with a camera icon on it, he may also take a matching Animal Photo token or matching Landscape Token and play that to the board. If a player draws a special extraordinary landscape domino, he can use this to split the domino path into two different arms. The next player then takes their turn, going through the same phases. The game continues until the sand timer runs out. At this point, the players have a chance to regroup and talk strategy. Once they have had a chance to discuss things, the timer is flipped over and the team has another 10 minutes to place their dominos and tokens. 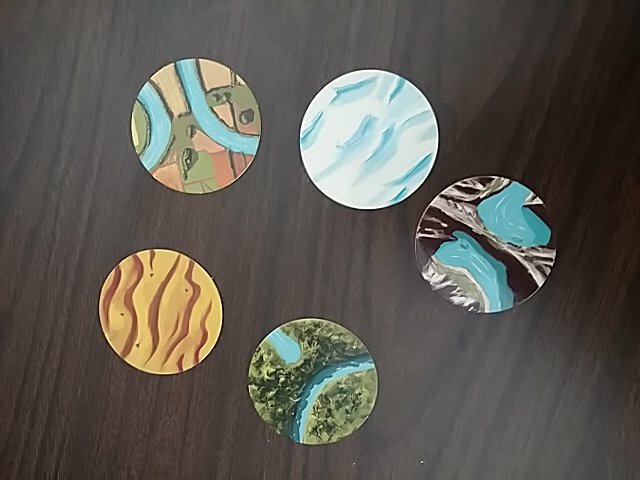 When landscape tiles are drawn, they are placed anywhere on the table. The active player can determine the orientation of that landscape tile. However, once placed, the landscape tile may not be moved anymore. If the camera domino is used to draw an Animal Token, the active player first places the camera domino to the board, and then the Animal Token is placed on top of it (possibly also using an adjacent domino to help balance it). If the players want, they can choose to take the combination of a camera domino and its corresponding Animal token and place them off to the side of the domino chain. This might be done to prevent accidental toppling of the chain. The domino and token can be picked up and placed in their correct location at any time – but this must be done before the end of the sand timer. This placement phase lasts until the time runs out for the second time OR when any of the players has drawn the last tile from their supply stock. In the next phase, the domino chain is toppled. Starting from the first domino placed on the start tile, the dominos are tipped over and everyone gets to watch them fall. Hopefully they all fall down at once. If they do not, you can use a re-trigger tokens (you have 10 of them) to push over another domino. Each time you need to restart the domino falling, you give up a token. If you have no more tokens to give, you don’t lose anything else. You keep pushing over the dominos until they’re all on the ground. You then compare your score to the chart in the rules – the goal is to have the highest score possible. A perfect score is 55, but honestly, it seems like anything over 35 or so is a really good score. This is an interesting cooperative game, and one with a theme and mechanism not often seen. I used to love playing with dominoes as a child, and this game brings back a lot of those fond memories. At first, it doesn’t seem like there is a lot of strategy to the game, but after a few plays, I can see that good groups will maximize each turn, drawing tiles quickly and playing them to board rapidly. The key is to make use of as many tiles as possible when you draw them… sure, you can always place them on your reserve stack and then go back and get them later – but when you do that, you lose a lot of time because it’ll take a whole turn later to use that tile. If you end up drawing a tile that you can’t use in your current domino layout – the best plan is to place it on the table where you think the domino train will go, and have it already in place, all ready to go… It may also help if you get the Landscape tiles down earlier – this will give you motivation and direction to place your dominoes in the right place. It will likely take a game or two to learn the tolerances of the dominoes – if they are too close, they may not fall easily, but if they are too far apart, they might not keep going in a chain reaction. Also, when you have the Animal Photo tokens on top of the dominoes, you need to make sure to place the dominoes underneath in such a way that the token stays on top of the dominoes after they have fallen. All of this improves with trial and error – you just have to do it to get better! The game itself plays quickly. The two ten-minute periods of placing dominoes is furious action because everyone is trying to place their dominoes down as quick as possible in order to maximize the number of tiles that the group places – but at the same time, it takes a lot of concentration to make sure you put them down in the right place. Once you start pushing over the dominoes, there’s really only about 3 minutes left in the game! If your group has moved onto the advanced technique of placing tiles all over the table trying to take advantage of the draws, the latter part of the phase is usually a complicated ballet of getting everything connected together so that you can score points! The game seems like it would scale just fine – the number of dominoes in the game remains the same – they are just split up differently amongst the players. So, you’ll get fewer turns when you play with more players, but you’ll also have more voices to help you place your dominoes and you’ll get the enjoyment to play with more people at the same time. I have enjoyed my plays of the game, though at times it feels more like a group activity than a game. Sure, the team has a goal to score the most points – but for some reason, comparing a numerical score at the end of the game just doesn’t feel as satisfying as vanquishing evil from the world or saving it from communicable disease. The other feature of most cooperative games which is missing is the tension of having to make the “right” decision so as not to cost the group the game. This is somewhat replaced by the time tension, but it does not feel as compelling. The wooden dominoes are the right weight – stable enough to stand up and withstand slight knocks of the table, but still easy enough to manipulate. The tokens are thin waxy affairs, but this also seems right for this game because you want them to be light and to fall down easily onto the dominoes. I’m not sure whether it is by design or not, but the glossy surface of the tiles tends to make them want to slip off of the dominoes, making is a little bit harder to keep them onto fallen train to score points. This entry was posted in Essen 2015, Essen 2016, Reviews. Bookmark the permalink.